I've received a bit of criticism about my lack of Belgian Ale coverage. The truth is, I have had many Belgian Ales and never really found one I liked so I pretty much gave up on them. Now, this weekend I was on vacation. A few people offered to go to the liquor store and pick up some beers, I declined to attend picturing an evening ahead of cards and BL Smooths. After about 10 minutes, I got a call that I needed to proceed to the liquor store post haste because they were having an Octoberfest Event with a 60+ beer tasting. I secured a driver, and made my way there. First off, the Kappy's Liquors in Falmouth, MA is incredible, their selection was amazing and I could have spent all day in there. Second, they had a lot of great brewers in house. I liked the Cape Cod Brewing IPA, I liked the OffShore Ale Co's IPA enough to pick up a 6 pack. I visited my friends at Harpoon and Sam Adams. One of the last tables was Belgians and I thought, it's free, you gotta try one. After speaking a few minutes with the beer rep, I chose a Belgian that was on the dark side, the Angelique. The beer was malty and heavy. It wasn't light and fruty like it's brethren. It was delicious. I can't do a formal review on just a few sips, but it definitely brought some kick with 7% ABV. I may have to pick this one up again. I enjoyed many other beers as well, too many to name. But, the good news is that we may get a Belgian beer reviewed after all on this site. I like a Belgian beer. It's called Angelique by Belgique. It's more dark and less fruity than Belgians I am accustomed to. More to follow later. In the words of Johnny Drama, VICTORY!!! As in the Victory Prima Pils which I had the chance to try this past weekend. Now, it's been said before that I am not the biggest fan of pilsners. But the Prima Pils was definitely a different kind of pilsner. The Prima wasn't the run of the mill light, wheaty pilsner. The Prima was full on hop bitterness coming right at ya. It was a darker flavor than it's counterparts. Drinking this beer is just like drinking pure hop juice, so if you don't like sweet, delicious hop bitterness, pass on this beer. The person who offered me the beer described the taste as "sharp" and I'd totally have to agree. The 5.3% ABV is a bit on the low side for microbrew but that's OK. The Prima get a good solid 3.5. This should also give you Belgian Fans a ray of hope that one day I'll find a Belgian Beer I like. Interesting article here about the recent hop shortage and how Sam Adams founder Jim Koch helped out the little guy by selling his surplus hops at cost to smaller brewers so they could stay in business. So next time you pull out one of your favorite local microbrews tip your bottle to Jim Koch for a job well done. This article by the way was randomly sent to me, good job whoever sent it. 4. Corona - if I am going for Corona, it better be Summer and an outdoor wedding. 5. The wedding couple clearly hates beer drinkers so I am drinking 7&7s all night. This time I settled for Miller Lite, and it served me well all evening and I woke up hangoverless which is always important. Am I the only person with a Wedding Beer Rotation? By the way, there are some times when a wedding has just a fantastic beer available and usually I'll knock one of those down before going to the comfort of my rotation. * I sometimes think the 5 stages of death are the only thing I remember from college which is odd, because it's not like I am a social worker. I do also remember the professor of that class let us out an hour early each week so everyone could be home in time for Monday Night Football. Also the kegerator project is on hold, I blame the economy. I am not really big on flavored beers, Cherry Wheats, Blueberry UFOs etc I tend to pass on. I was extremely hesitant to try the Punkin Ale for a few reasons. One, I am not a big fan of pumpkin anything. Two, my aforementioned bias to flavored beers. And three, the fact there is crazy and then there is Dogfish brewing crazy. Needless to say after a week or so of badgering I tried the Punkin Ale. I noticed immediately, it didn’t taste like a pumpkin. And then I realized what kind of beer it really was, a brown ale with a cinnamony and brown sugary kick that added just a hint of spice to a smooth alcohol tinged brown ale. The confluence of flavors gave the beer a syrupy texture perfect for a fall beer. The 7% ABV will also keep you warm on those cool fall nights. The Punkin knocks down a 4.0 ranking. 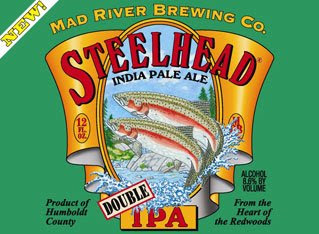 I think if I have learned anything about beer, it’s that I enjoy an IPA, so when I see on the menu the Steelhead Double IPA, I just have to try it, thinking I am going to be looking down the barrel of a great hop experience, not so in the case of the Steelhead. The beer was all hop character and had such an overpowering alcohol taste that any hint of malt was eliminated. The beer also had the consistency of a medicine elixir. Brewers tend to try and up the ante when driving ABVs up over 7.5, but in the case Mad River at 8.6%ABV sacrificed flavor. The Steelhead gets a 2.0. First of all, how about this six pack on the left? This is exactly how I found it when I researched the deep recesses of the liquor store near my house. How awesome is that collection of beers? The fact that someone took the time to collect singles of all of those and then took time to put them in those six pack plastic rings is mighty impressive. I am calling it The Hobo's Special, only because I like the word Hobo and don't think it's used enough anymore. Onto more important things, Fall is a great time for beer as a lot of the brown ales and Oktoberfest seasonals start coming out. I cannot wait. I've already sampled a few seasonals and the reviews will be pouring in the next few days. 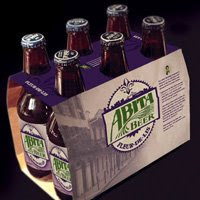 I'll be the first to admit that I want to like the Abita Fleur-de-lis Restoration Ale. I love the city of New Orleans, it is a tremendous place to visit, but this bias should not be reflected in my review. I thought the beer was going to be strong and come out fighting, instead it came out light throwing me for a loop. Instead of doused with an expected strong malty taste, I was spritzed with a grape citrusy flavor. After a few more sips the unique grape whispers began piquing my palette. Personal biases, unachievable expectations and unexpected styles aside, I am left rating this beer a 3, a draw in a way. Fair? perhaps, perhaps not. This beer is on my radar however. It's been a month, I know. I've seen your emails, your frantic texts. Some, have pulled me aside at religious ceremonies asking when's the next post. Truth is, I've been at the Hamptons with my new pal, Chuck Bass, no not really. Unfortunately, the Crusade doesn't pay the bills and I have been burning the candle at both ends. I apologize. I have been drinking and I will be releasing some reviews over the next few days.